Because His promises are infinitely better than mine. proved to be too much for my mind and spirit. fever and cough, only a few hours of “well” in between. By day six, ten minutes without crying was my limit. we were going out for dinner. Then the sunlight hit my retinas. a three hour nap after telling the kids, "Eat whatever you want." We've gone through a lot of cereal this week. While I know "Greater is He Who is in me,"
Satan is still pretty smart. Smarter than me. lying alone there in my room, in the dark. I didn't even fight back. followed by an apology a few hours later. All because I wasn't fighting back. and thinking about how I could have done things differently. Why didn't I have praise and worship music playing? Why didn't I stop and pray before I said words I couldn't take back? Why have I read 127 internet articles this week, but few Bible verses? Pain and sickness, two of the easiest ways to pull my eyes from Jesus. In hindsight I see everything I could have done better a little more clearly. wouldn't have been so far from my mind when I hit this wall this week. Live and learn? I hope so.I can't believe I was so unprepared. not quite as ready for the “normal” as I thought. Pretty sure that I still owe them a better apology too. and even failing completely an hour ago, doesn't mean the day is ruined. Headed to Christmas at Mom's now. My oldest child is driving while I type. Looking forward to french toast, bacon and eggs. Expecting to gain back some of the nearly10lbs I've lost this week... and not care a bit. a roaring lion, looking for someone to devour. makes every struggle worth it. He does for me, He will do for others as well. than I could get from any other source. to teach myself something I was missing. but the most important one is this: Because He told me to. I started this blog to hold myself accountable for my issues, to work through them and give myself a visible timeline showing what my walk with Him looks like, to help me learn to rely on God over all else... not to give those who wish to persecute me a list of my mistakes, slip-ups, stumbles, and out-right acts of rebellion. But I haven't written as much lately because some turmoil in my life has been created by someone who wishes to do just that. Today I'm reminding myself of the reasons I write, and reminding myself that God has a plan here that I can't let go of... even if others will try to twist it to use against me. Three steps forward and two steps back makes the journey slow at times, but it is real and honest. If I am nothing else, I have to be real and honest. A recent speaker to my church talked about being called a workaholic. He said he laughed when he heard it, "I hate work! I'm not a workaholic." The response was that it isn't the work he was addicted to, it was the finished product. It was the satisfaction of a job well done. It was what he gets from doing the work. I thought to myself, "So maybe I'm a volunteeraholic?" That week alone, between a special conference and volunteering for other things, I had spent over 20 hours at the church. I am there, volunteering, several days a week on a slow week. Several times a month I volunteer at the local food pantry that helped me when I needed it most. I recently volunteered to babysit a friend's newborn foster child while she works her third shift job a couple nights a week. And if a friend asks for help with something, I make sure I do what I can. But why? I am a single mom with four children and a business to run. I could tell anyone on any given day that I'm too busy to do anything else and they would understand. The opposite of love is self... selfishness... and we are to love one another. That's what I am doing.. serving people Jesus loves. Giving of myself to help further His Kingdom... right? I'm also having a lot of fun doing some of it. I truly love working in the sound booth and working with the lighting, media, and video. I hope God is giving me this opportunity for a reason, that I am gaining skills that will be useful to Him in the future. All in all though, regardless of how it works out, I know I am doing it for Him. It is impossible to ignore, however, the sense of satisfaction I get, the boost in my own self-esteem and self worth that comes from being important to others... I sometimes wonder if these positive aspects of volunteering don't push me to do more than I should. Why is being appreciated by people so important? I have worth to Him whether I am helping with one more thing or not. While wrestling with this thought lately, God has shown me several times that doing work for Him is a lot easier than resting in Him. Easier than resting? Resting is easy. Resting equals laziness. While nobody would come right out and say that, internally it is said loud and clear in the silence, the absence of accolades. Too tired to read the Word, too scattered to pray without making it a "multi-tasking" opportunity, I neglect Him more than I should... and I often do it IN HIS NAME! While God loves it when we nurture our relationship with Him, it is harder to explain to people that the reason behind a "no" is because our relationship with God is suffering. So, we tell Him "no" instead. Then we continue to push Him farther away by spending so much time doing things for Him instead of just spending time with Him, resting in His presence. That's the key. Anyone can take a day off. Anyone can turn down duties or quit serving in certain areas. Resting IS easy. 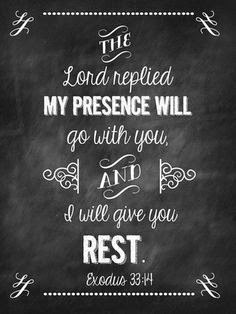 Resting in Him isn't. It's not really all about me... it's about Him and how learning Who He is has changed my my life. A single mom of four, rescued from homelessness and hopelessness by my loving Heavenly Father, I spent almost two years writing this blog about trying to prove to Him I was worth the sacrifice... and constantly failing. When I discovered the Gospel of Grace, and realized that God doesn't care about my promises nearly as much as He cares that I understand His... my life changed forever. I no longer write as a way to hold myself accountable for my promises to Him, but as a way to share the grace message with others. The real Jesus changed my life. chucketate | Husband. Father. Pastor. Writer. Part-Time International Spy. Tips on Life from "Hire A Housewife"